Eating only healthy foods can be difficult at times, not only because it seems to be less appealing regarding taste, but also because the makers and media advertise all food products as healthy even when they are not. 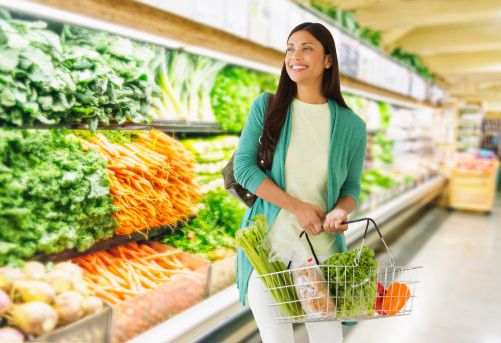 When one goes shopping it can be difficult choosing the right food items due to the labels like organic, low fat and only a very low part of the original calorie count. One does not know which product to trust and which product to choose to improve their health, while losing weight. All these food items only waste the energy and effort an individual puts into dieting. The right direction for an individual looking to choose only healthy foods is to avoid all food items that have an ingredients list on them. A grocery list has been provided below which aims at making individuals realize that they need not count the calorie they are consuming with each item they eat. It is necessary to feed the body real food so that the body is able to take its share of the nutrition it requires. The weight loss grocery list mentioned below is made up of food that are rich in nutrients and do not contain any additives making the body healthy overall. Fruits: bananas, apples, oranges, cherries, watermelon, peaches, apricots, pineapple, and tomatoes are some of the fruits which one should try to fill their carts with when at the grocery store. One can choose any other fruit that has not been mentioned in this list if one intends to eat it to stay healthy and lose weight. Vegetables: Mushrooms, onions and carrots along with loads of green leafy vegetables should be bought to make up a huge part of the diet. Beans: One should purchase beans since, the process for cooking them is quite easy and all one has to do is toss them into the cooker along with salt and pepper and let it cook. One should try to buy the biggest bags of beans available then one can purchase the items at low costs and choose low sodium options as well. Nuts: Nuts have numerous benefits and are an essential part of the diet. Brown rice and whole wheat pasta are the most common components of any weight loss grocery list. One should not hesitate from choosing the kind of meat one likes be it chicken, pork or any type of seafood. You should definitely stay away from products that claim to be healthy and have a long list of ingredients on their packages, since a product with so many ingredients is not considered to be healthy without inclusion of chemicals and artificial components. Also read the nutrition information listed on the package as it provides an insight into the product. Protein or nutrition bars, shakes which replace meals, low calories frozen meals are some of the meals that will definitely have a long list of ingredients which you should avoid.